Turkey’s President Recep Tayyip Erdoğan is aiming to be the longest-serving ruler of the Republic of Turkey in 2023, and has earned himself the recognition of being one of the leading populists of our times. In contrast to other countries like Venezuela which has been under the populist ideology of Chavismo since the late-1990s, Turkey’s Erdoğan has only since 2007 been classified as a populist leader, based on an analysis of his speeches. Although this is unsurprising to some supporters, there are still critics aiming to prove that Erdoğan’s populism has been persistent. In assessing such claims, it is helpful to follow Jan-Werner Müller’s book What is Populism? (2018), where he establishes a guideline distinguishing populists from non-populists in the absence of a previously drawn criteria or theory on populism. He outlines a populist leader as anti-elitist and anti-pluralist, often conjuring up a foreign enemy. They base their politics on a moralised conception of politics where the leader is the sole representation of the ‘people’, rendering all opponents as immoral or against the people’s will. In the following, I will provide a detailed analysis of why, according to Jan-Werner Müller’s What is Populism?, Erdoğan has become a populist leader only after 2007. At first, in 2002, his speeches involved human rights and democracy, and the AKP labelled itself as ‘conservative’ rather than ‘Islamic’, following the christian democratic parties in Europe. Müller acknowledges this, saying that Erdoğan was doing something democratic when he stood up for the ignored poor and devout Anatolian masses (85). At a time when head-scarves were banned in public buildings, barring many women from high education, Erdoğan’s promises of justice, rights and condemnations of coups appeared as steps towards democracy. When Atatürk, the founder of modern Turkey, eliminated the caliphate and introduced language, dressing, and other reforms, an elite secular class emerged from these new habits equalling modernisation with westernisation. Erdoğan’s polarising speeches thus tap into the decades-long divide between the secular elite and the devout Anatolians. However, Müller warns against attributing a social-psychological perspective fixated on certain classes. “A number of surveys have shown that one’s personal socioeconomic situation and support for right-wing populist parties often do not correlate at all” (15). This is evident from how Erdoğan also garnered support from the provincial entrepreneurs and some liberal elite hit by the economic crisis in 2001. Although he was an anti-elitist from start, Müller argues with his first key point that “it is a necessary but not a sufficient condition to be critical of elites in order to count as a populist” (2). Therefore, in order to count the early-Erdoğan as populist, it is not sufficient to just point to his anti-elitism, since populists are always antipluralist who claim that they alone represent the people. This was not the case with Erdoğan until sometime in 2007. For instance, during the 2007 General Election, the Patriarch Mesrob II Mutafyan of Constantinople supported Erdoğan’s AKP, claiming that Erdoğan has been supporting Armenians’ rights and was less nationalist than the Republican Party. Yet, later in the same year, AKP launched a move towards ending the military threat pervading his previous Islamist predecessors, this time as an alleged coup plot named Ergenekon by a secularist organisation leading to questionable trials. It seems that this is when the Pandora’s box to populism in Turkey opened. Building on his argument, Müller states that populism is not defined by a specific electoral body of class but rather through a moralised understanding of populism which enables the populist politician to claim that they alone represent the people (3). He claims that often, these populist politicians portray their opponents as immoral and not part of the people at all, which is a threat to democracy as democracy needs pluralism (79). For example, in 2012 Erdoğan asked “We are the people. Who are you?”. The same year he told his supporters: “These people look down their noses at the people… For years they have belittled the true servants of this nation…”, where the true servants and moral people are defined as his supporters, and protesters like the ones in Gezi Park in 2013 are not proper Turks at all. There is also the further assumption by populists that there is one common national will aiming at the national good. Erdoğan’s speeches have adopted this mantra: he even campaigned under the slogan “National Will, National Power”. As Müller highlights, it is for this reason that corruption allegations like the one Erdoğan faced in 2014 (for which he blamed the destructive outside forces) will not affect a populist’s popularity (46), since they allegedly work towards the populists’ moral good. Müller therefore warns liberals that they must let go of the illusion that exposing populists will discredit them. The organisational structure of populist parties, according to Müller, can also expose them. Like Erdoğan’s AKP, they tend to be one-man shows unlike the democratic ideal where parties elect the best candidate (36). 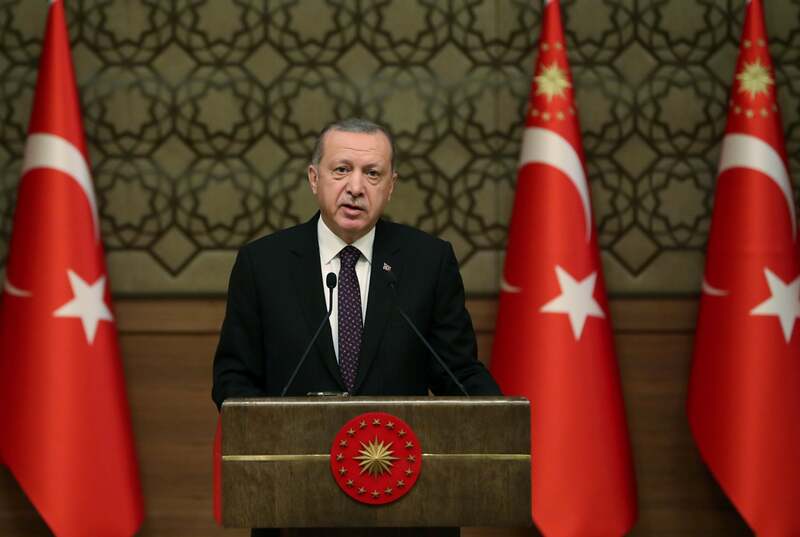 In 2018, Erdoğan secured a referendum, moving away from the parliamentary system to a presidential one, granting him more powers and securing his position. Furthermore, Müller discusses how populists tend to conjure up a foreign enemy, delegating their own supporters into positions of power, and suppress the media (42). Erdoğan’s shifting of 3,000 judges, and the widespread reports of his free coal and household goods distribution during the local elections in 2008, and the prosecution of hundreds of journalists after the 2015 coup-attempt allegedly by a foreign agent Fetullah Gülen, tick all of Müller’s boxes. Although this anti-elitist, anti-pluralist, polarising, and moralistically dividing version of Erdoğan is new, some of his critics have said that this outcome was predictable, pointing to an article in 1996 in which he reportedly said that democracy is like a tram, which one gets off when one reaches the destination. He may have had authoritarian tendencies, but his early campaigns, speeches and method of ruling under the AKP, until 2007 still lacked the anti-pluralist condition — at least on the surface — which later confirmed him as a populist. Müller warns us to not respond to populists like Erdoğan by excluding them from debate, since the answer must still be democratic, but instead to call them out on their populist tendencies (113). He suggests the abandonment of the term ‘illiberal democracies’ since populists use it to maintain international status and since populism is inherently antidemocratic (55). He also claims that a country may hold elections, but still be an uninformed democracy with a silenced media and a suppressed opposition. Ultimately, Jan-Werner Müller defines ‘popularism’ in his book under two over-arching principles of anti-elitism and anti-pluralism. Essentially, Müller provides us with a much-needed criteria that can adequately define populism and identify populists like Erdoğan. However, the historical or political explanations for the emergence of populism are not discussed by Müller, which would help us better understand populism overall. Further questions to explore include whether growing populism is an international movement rather than a cluster of isolated national movements. The global surge might have inspired and encouraged Erdoğan to become a populist around 2007, if it had not been on his agenda earlier.